BANGI, 27 Oct 2013 – The life-long dream of the Tun Abdul Razak Award winner, Kan Chan Siang is to open a hospital where the poor and the less fortunate can receive free medical care. 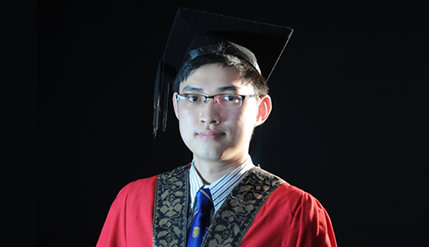 He is one of four students who received special awards at the 41st Graduation of The National University of Malaysia (UKM) currently being held here. Kan, 25 graduated from the Faculty of Medicine and is now serving his housemanship at the Sultanah Aminah Hospital in Johor Baru. The youngest of three brothers, Kan’s father Kang Yuen Hang, is a 69 year old retired contractor while his mother, Lim Nyin Sid, 63, is a tailor working from home. He is grateful to his family for their support to see him through his education. He said he was not a good student in the lower classes and had in fact failed his bahasa Melayu paper in the UPSR exams and was then enrolled into the remedial class upon entering secondary school. But his parents never stopped believing in him even though he had then thought of giving up and just get any small job. He eventually managed to get back on track when a teacher from his secondary school helped him by enrolling him for a Bahasa Melayu poem recital competition. He did not win but the teacher, Puan Norazah, presented him with a gift for trying. His two older brothers, Kan Chan Koun and Kan Chan Hua, both had to stop schooling and work to help support the family. One of them had wanted to become an accountant but put his dreams on hold to save money to help meet Kan’s university fees. Speaking about the award, Kan said he was told that he was shortlisted for the Award along with five other candidates and had to go for an interview. About a month after two interviews by officials of the Yayasan Tun Abdul Razak he was informed that he had been chosen to receive the award. “I was at home at the time, so after getting the call, I turned around and told my parents about it. They were very happy for me and congratulated me for my success,” Kan said. Kan hopes the award would show his family that all their support and efforts to ensure that he can continue studying would be worthwhile. It is a reward for his family who have sacrificed a lot so that he can achieve his dream of becoming a doctor. Being a doctor is a very good way of serving others. It is a profession that requires patience, dedication and feeling for others. He do not believe that students should be forced by parents to take up medicine as some will merely study half-heartedly and will not fully appreciate the knowledge gained thereby resulting in a doctor not committed or even care for their patients. Kan wishes to further his studies to be a cardiothoracic surgeon. His main reason for becoming a doctor is to serve others, to serve patients especially the poor who cannot afford to pay for medical care. Thus his dream of operating his own hospital that is specifically for charity where patients are charged according to their ability to pay. “The hospital that I dream of setting up will be charity based, where both the rich and poor can come, but the rich will be charged the standard rate while the poor may get treatment for free”. He said there are many generous people who want to donate but do not know where. So they can then donate to this hospital and see how their money is spent, he said. Kan received his award at the third session along with the recipient of the Vice Chancellor’s Award, Ho Jing Liang also from the Faculty of Medicine.